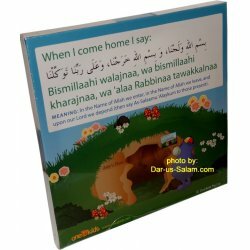 These canvas dua frames are perfect for reminding your child (and yourself) of the various dua's (supplications) Prophet Muhammad (pbuh) recommended we say throughout our day. There are a set of six in this dua series; this one teaches what to say when you come home / enter the house. New stock is made with improved high-quality stretched cotton canvas on an environmentally-friendly MDA wood frame. Lightweight & measures at 10x10" (25x25cm) and includes hanging hook.